Pictured, from left, is Ellen Mock, Honeywell Foundation’s corporate relations manager and Tabitha Cooper, Paragon Medical marketing, communications and project manager. 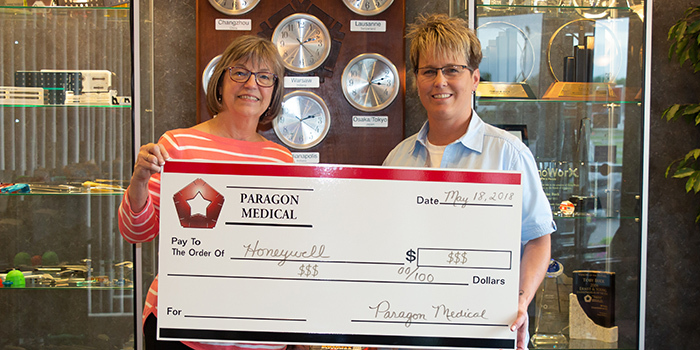 KOSCIUSKO — Paragon Medical, Pierceton, recently contributed to the Honeywell Foundation Educational Outreach Program. During the last school year, the program provided curriculum-based arts-in-education activities to 3,974 students in several Kosciusko County schools. Paragon Medical is proud to partner with the Honeywell Foundation. They recognize the importance of this program and the impact it has on many young lives in Kosciusko County communities.